Data source: Ministry of Health, Labour and Welfare, and Statistics Bureau, Ministry of Internal Affairs and Communications, Japan. 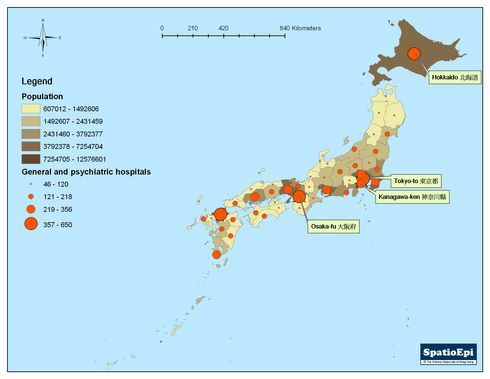 Map shows the number of general and psychiatric hospitals (2007), expressed in graduated symbol, against the background of population (2005) in graduated colour by prefectures in Japan. The size of the orange balloon is proportional to the number of hospitals; while the darker the colour of the prefecture indicates the higher the population. As the highest population area in Japan, Tokyo-to has the largest number of general and psychiatric hospitals. The second highest population area is Osaka-fu, followed by Kanagawa-ken. Hokkaido has the second largest number of general and psychiatric hospitals, followed by Osaka-fu. 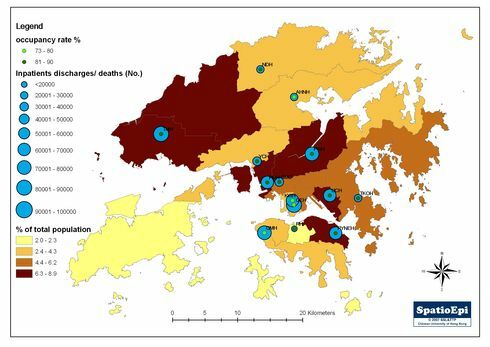 Like other developed countries, the map shows that hospital services are often centralised in metropolitan cities where the demand is often the highest.